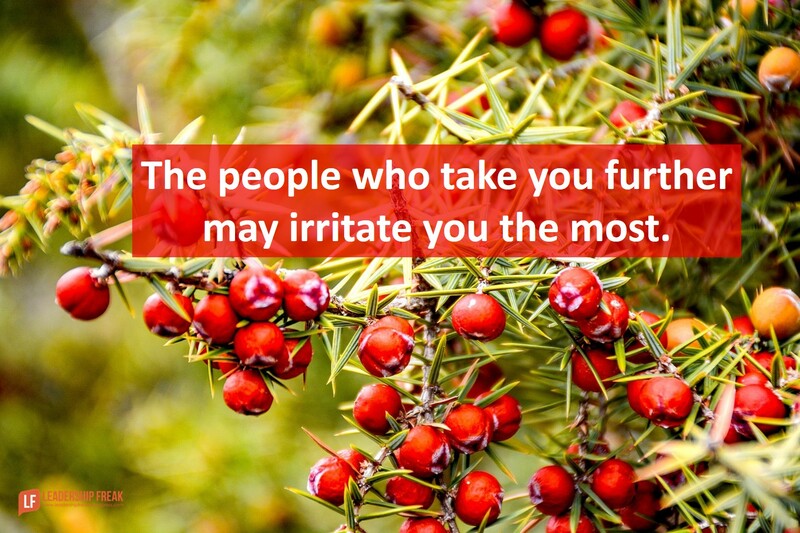 The people who take you further may irritate you the most. Conformists provide steady progress. Contrarians, complainers, and irritants innovate. People who want change tend to complain. But some complaints come from dead weight. Reject monkey throwers. These people are dissatisfied, but want you to make things better for them. They’re more concerned about personal comfort than working toward improvement. Irresponsible complainers want you to take their monkeys. Pay attention to complaints from people with skin in the game. They embrace the mission and believe in improvement. Hang with the dissatisfied, as long as they work to make things better. Determine if they are contributing-complainers or dead weight. Don’t allow complaints to obscure contributions. Sometimes the people who irritate you the most are making significant contribution. Where would you be without them? Listen to their concerns. Ask a few questions. Ask, “Can we fix this?” If they say, “No,” the issue is commitment. If they say, “Yes,” their mind shifts toward solutions. Explore what they really want. Pushy. They don’t go along. Dissatisfied. They aren’t happy with the status quo. Different. People who are like you take you where you would have gone. People who are different from you suggest surprising alternatives. Discuss how contributing-critics might add light to their darkness. But don’t expect them to turn into bubbly flower children. How might they express gratitude? It’s not enough to feel grateful. Gratitude must be expressed to have positive impact. Tell me three things that are working. What are the strengths of the people on our team? How might leaders get the most from people who seem like irritants? Irresponsible complainer is a great distinction. Excellent post. Salient points to remember, Dan. I have worked with irresponsible complainers who are perennially unhappy, as well as people who complain but offer good points to ponder and even suggest solutions. They have strengths that complement the strengths of other team members. In one case, the complainer just didn’t know how to voice good questions and concerns without sounding negative, but she had good ideas for improvements in our procedures. Ask complainers and other irritants to bring solutions to the party. Some compaliners offer –vague, general comment. You need to require them to be specific and precise. Some complainers just want to vent, or they want others to change; not themselves. But on the other hand, if no one is arguing, complaining, and debating the options you may have groupthink. try to understand them, understand themselves and why they consider a person as an ‘irritant’ to themselves, their team – is the person really an ‘irritant’ or is it more they are feared, feared for daring to be different? “Different. People who are like you take you where you would have gone. People who are different from you suggest surprising alternatives” – this I like, alternatives are good, provides options, variety, shows an open mind, thought, willing to explore. A wider viewpoint. I’m in the alternative sector for solutions, there are options that are not always Black and White, seek input from all parties and work as a team.It is not always about change there can be compromise for the betterment of all. While I agree with you that contributing complainers add value by pushing for change, sometimes their overall impact can be perceived as negative. They tend to dampen team morale, and sometimes this dour/complaining attitude can lead to dissatisfied customers – even though their work is delivered to acceptable (or even high) standards. If, as a leader, you cannot get them to “add light to their darkness”, you might eventually have to let them go! I call BS – if the problem is regulatory environments, interdepartmental friction, lack of interest from the top, no, you can’t fix it. All the commitment in the world won’t help if a regulatory body wants to drive truck through you. In my experience, “complainers” are often willing to give voice to what everyone else is thinking but unwilling to say because they fear being shut down or shut out for advancement. Ultimately, leadership communicates whether or not differing perspectives is welcomed or discouraged. I’ve worked in both environments. I’m starting year four within an organization that encourages everyone on our team to provide input and ask hard questions when we find current methods don’t align with ever evolving circumstances. My commitment, motivation, and morale couldn’t be hired. I wish all workers enjoyed similar workplaces.